Since we have so much going on in the basement, (a new family room, homebrew corner, storage space, bathroom renovation), I thought it would be easier to break up the posts, so it's easier to pay attention, (and keep me from rambling, sorry, probably not). First, I'll focus on the nook area. Which turned out to be one of the hardest decisions we had to make for this whole project. Picking out bathroom fixtures and paint colors...easy, making decisions for built-in storage spaces...paralyzing. Maybe because all the decisions made were permanent. Well as permanent as a wall can be, (obviously in our house that's not that permanent), but it would be something that Mike built in and finished. Last time I took you downstairs, Mike had torn out the walls to remove the chimney. Since we moved in we always knew we would add some sort of bar area here since it would be the perfect spot for entertaining. 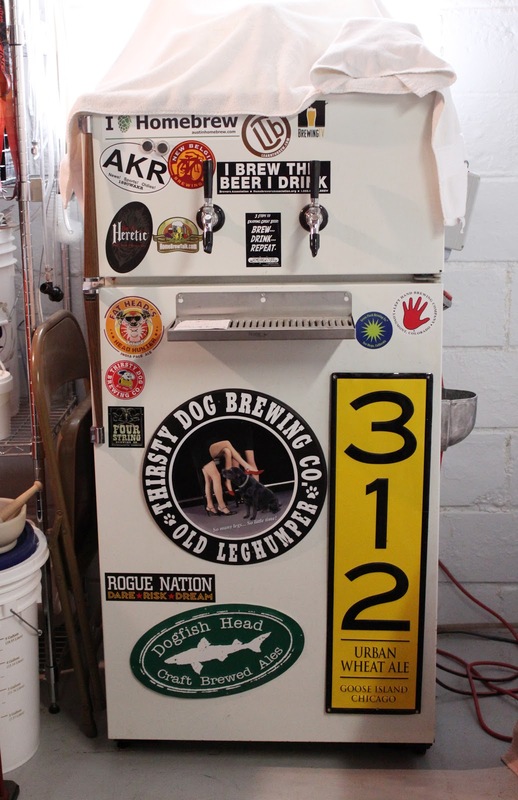 After Mike started homebrewing and acquired this beauty, (and did all the retrofitting himself), we figured this nook would be perfect. Except, with most hobbies, you don't stop acquiring more equipment. And, 6 taps are better than 2. So, now we had two kegerators to fit in the nook, and no matter how we configured it, they did not both fit. Although there were talks of moving the corner of the wall and having one stick into the room. 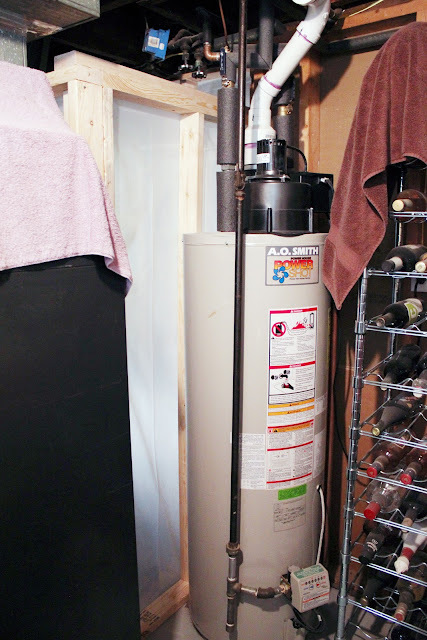 The fact that the corner of the nook is one of the structural columns to support the house made that decision an easy one to dismiss, (well for me, Mike fought a little harder since he really wanted both of his kegerators here, and he has the skills to move a structural column). It took 2 weeks, many arguments, a lot of crazy ideas, and many outside opinions, before Mike and our friend Dave finally came up with the easiest solution ever. Sell both units and get one big one. Duh! 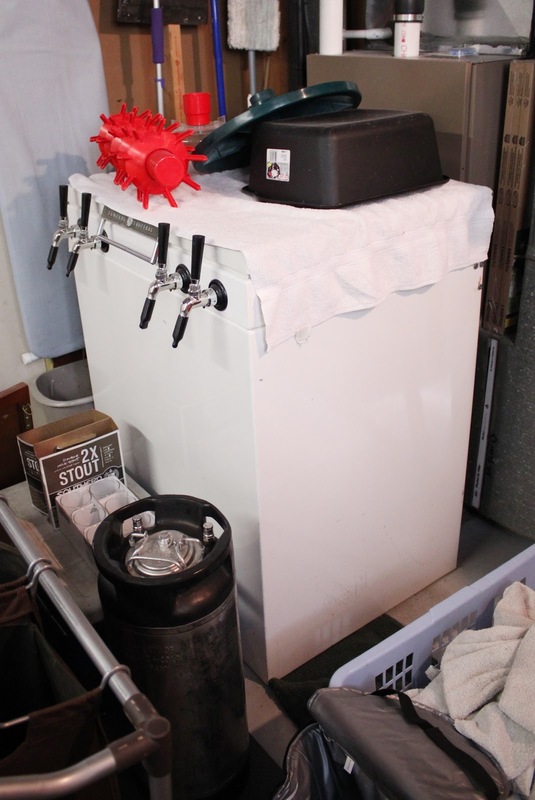 With a larger unit it will still fit 6 kegs, but have a smaller footprint, and use less energy than the 2 units together! 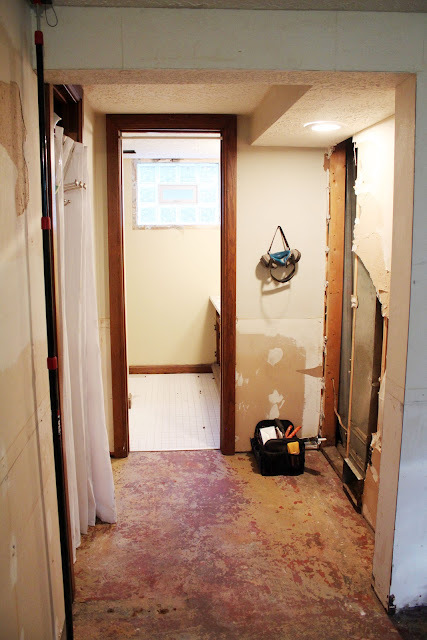 So, with this plan in place, (Mike will have to build everything, buy the new unit, move his beer, then sell the old units), Mike set out to frame out the nook. 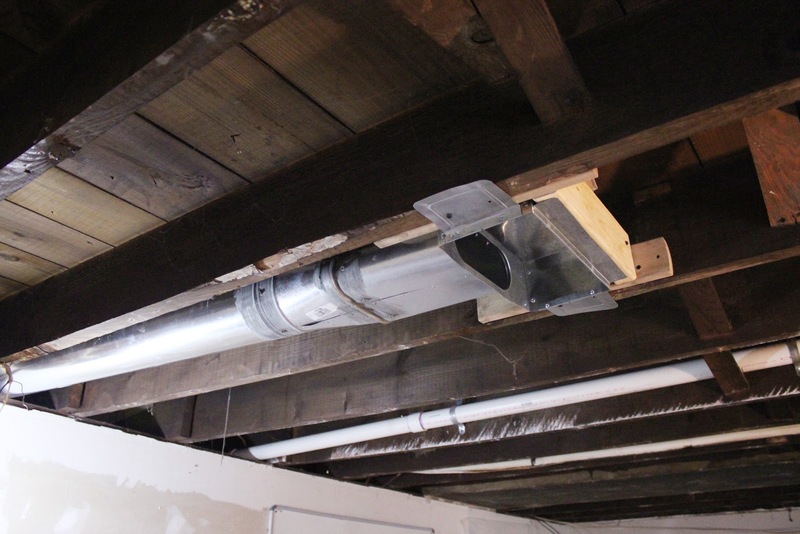 His first task was to move the duct vent seen in the picture from after removing the chimney. We decided the best use of this vent would be to move it out into the family room, (a heating vent wouldn't be very efficient if we left it to sit behind a chest freezer). Since we already have one on the wall adjacent to this one, we decided to put it in the ceiling. After a trip to Home Depot, this task was a quick job for Mike. While we don't really like the idea of adding holes to the ceiling, especially in a room where the height of the ceiling is low, our concern for adequate heat in the basement won out. 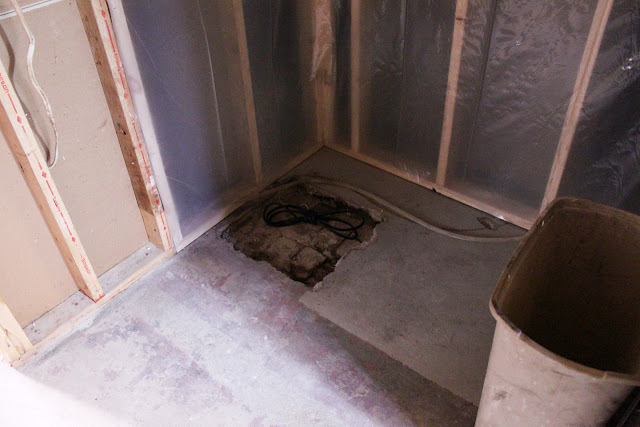 We're hoping with the extra vent, insulation in the walls, and flooring, we'll be okay in the winter months. Back to the nook. 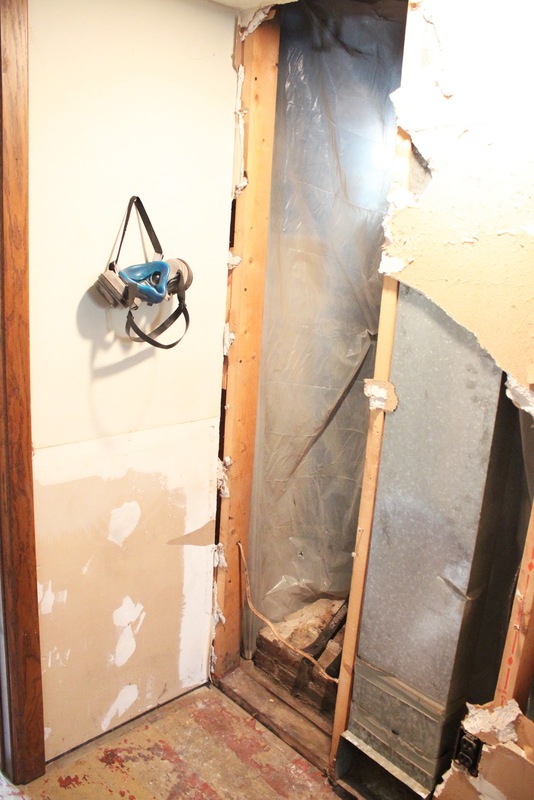 Mike utilized all the space he could and framed everything out to prepare for drywall. 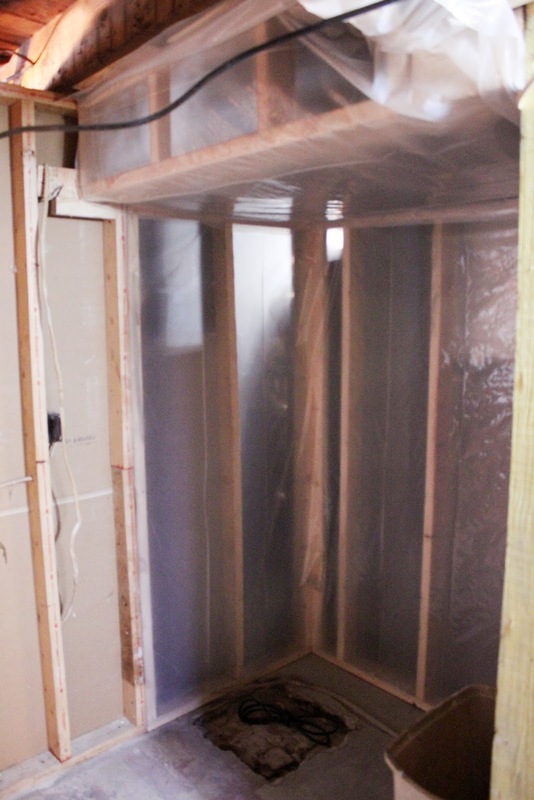 The soffit is framed around the duct work that goes to the bathroom to the left and the new vent out to the room to the right. He added the plastic to prevent dust from getting into the laundry where we are storing all of our things, not to mention our actual laundry. It's a small space so I couldn't get the entire thing in one photo, but here is the right side. You can also see the furnace behind the plastic, Mike used all the space he could and the walls sit a couple inches from the furnace. Before, there was about 3 feet behind the furnace, (when the chimney was there, we used the other space for storage of things we rarely used - snowboards and skis in the off seasons, things like that). I tried to get a picture of the space from the laundry room, to show how much more efficient use of the dead space back there was, but this picture doesn't really do it justice. Before, the wall was flush with the wall behind the water heater and booze, (#dontjudge). Next for the nook, Mike will fill in the hole left by the chimney and finish out the walls and soffit with insulation and drywall. 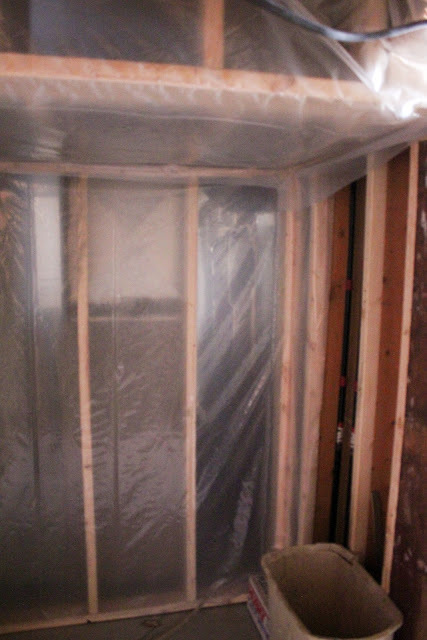 We're insulating the laundry room from the rest of the rooms to reduce the sound from the furnace/water heater and laundry since the TV will hang on the wall connecting the two rooms. Later this week I'll share our storage plans and the crazy obstacle course Mike's making me go through to do our laundry. I hope he doesn't mind dirty socks, because I don't do ladders!